From ancient Egypt to medieval Europe to contemporary Japan, shallow carvings have often been used to add imagery and interest to trays, boxes, furniture, and other flat surfaces. Working on prepared panels, we'll use simple hand tools to create relief carvings with smooth contours, detailed texture, and implied depth. You can use a provided design, bring your own, or take inspiration from historic examples. 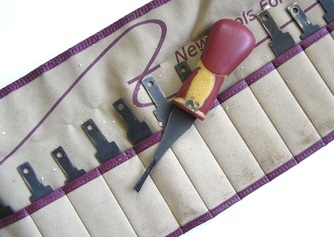 Beginners will get comfortable with a range of versatile carving tools and techniques, while more experienced woodworkers will gain new options for embellishing their own larger work. My tool roll with one handle and many blades; note that I store them point down. 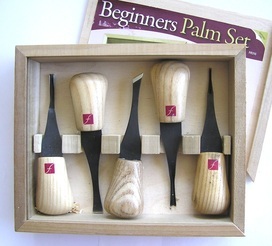 A boxed beginners set with fixed handles.